One of the Glyndebourne garden’s most important plant treasures is hidden away in the long grass of the orchard where a colony of bee orchids (Ophyrys apifera) has established itself close the gardeners’ hut. The orchids have seeded themselves abundantly, with many seedlings appearing in grass paths that are regularly mowed. During the spring Head Gardener Kevin Martin keeps a lookout for these stray seedlings and carefully transplants them out of harm’s way. It needs a sharp eye to spot the emerging leaves amongst the grass, daisies and occasional dandelion, and a steady hand to dig up and relocate the delicate young plants. After the seedlings are transplanted, the grass in the orchard is not cut until they set seed. In many parts of Britain colonies of bee orchids are dwindling. However, here at Glyndebourne, with a little bit of help from the gardeners, these beautiful plants are thriving. No one has satisfactorily explained why the flower should resemble the body of a bee. One theory suggests that the flowers served to attract bees to pollinate the flower, while a rival theory proposes the exact opposite, questioning the reasoning of a bee visiting a flower which appears to already have an insect on its petals. Another explanation was that the mimicry of a bee keeps herbivores such as sheep away, worried that they might be stung. Further studies into orchids recently suggest that the orchids produce a scent which is similar to the pheromones produced by certain female bees to attract a mate. Male bees attracted by this scent then attempt to mate with the bee orchid flower and, in moving from flower to flower, transfer pollen to other orchids. Whilst this is true for species further afield, in Britain, bee orchids appear to be self-pollinated. 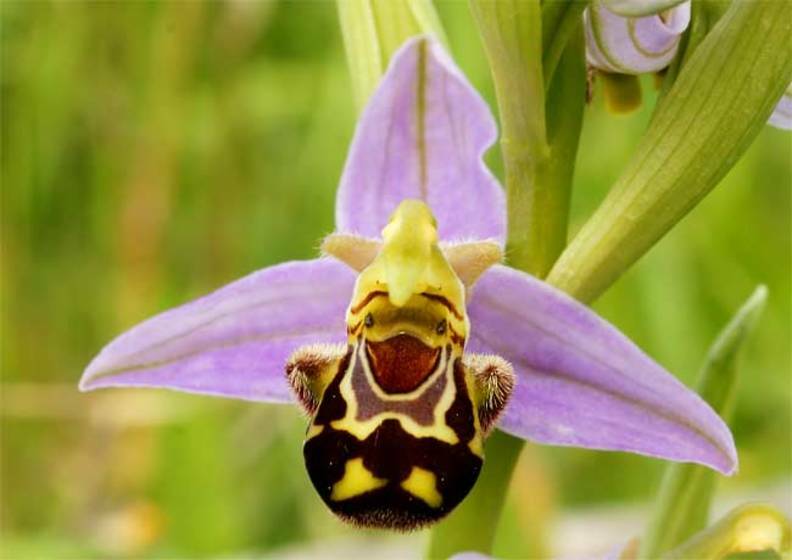 If you are visiting Glyndebourne during May and early June, take a detour from the main car park, past the Archive and, from the path, you should spot Glyndebourne’s bee orchids.